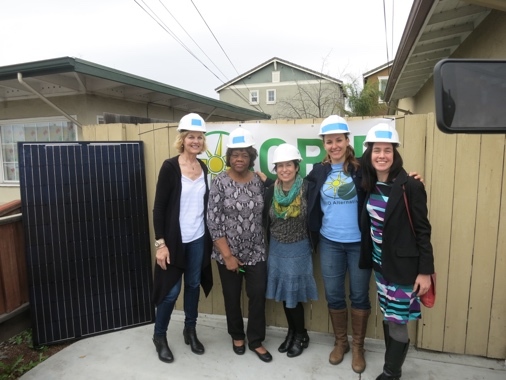 Menlo Spark has teamed up with the nonprofit GRID Alternatives and Facebook to bring free solar power to Belle Haven homes. The project is installing 10 solar systems in Belle Haven, saving those families around $250,000 over the next 25 years. The solar systems will also prevent an estimated 550 tons of greenhouse gas emissions, which is the equivalent of removing 100 cars from the roadways for a year or planting 14,000 trees. Supporting good, green jobs and local job training (for installation). Gloria Williams, a longtime resident of Menlo Park and one of the project’s beneficiaries, used to sit in darkness in her home, worried about high electric bills from using the lights. She received a 1.9kW solar system, covering about 90% of her electric bill and saving her an estimated $465 a year. She is ecstatic about the savings. "I think this is probably the way of the future, don't you?" she said. This project continues to accept applicants and funders. Contact info@menlospark.org to learn more.